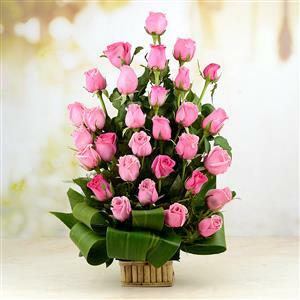 Send Beautiful Pink Roses to Chennai. Gifts to Chennai. Send Flowers to Chennai. Description : Coming with 30 pink colored long stemmed roses, Pink Beauty, is the ideal gift for someone who is very special to you in Chennai. Arranged in a basket, the greens add to the beauty of this flower arrangement. With this, you can also send other Gifts to Chennai through Gift2Chennai.com, to make an occasion a special one.